I've been enjoying my weekend so far. I still have another day to go before I head back to work on Wednesday and Pete and Jamie won't be home until tomorrow late afternoon. However, I thought I would post what I have done so far as I'm quite proud of myself for sitting bum on seat and being creative. Yesterday (Easter Sunday) I experimented with some resin pouring. I recently got a starter kit from Altered Image Studios http://www.alteredimagestudios.co.nz so I could have a go at pouring resin and consider how it might be applied to miniatures. The two wooden hearts, the domino and the wine charm all came with the kit. to do with Paris at the moment so she will love this. On the blue heart I poured the resin over a bit of handmade paper I had made. I love the way resin intensifies the colours. I put a William Morris paper on the domino. This was an image from a 1920s Girls Own Annual. This square I have done to make a little table top. The resin is poured over a paper from a 1938/39 Sanderson Samples Folder. I was really pleased with the way the square in the above image came out as I used a very thin wood as a base and I was concerned it might warp but it didn't. There is certainly potential for using resin in miniatures. I will have to experiment some more. 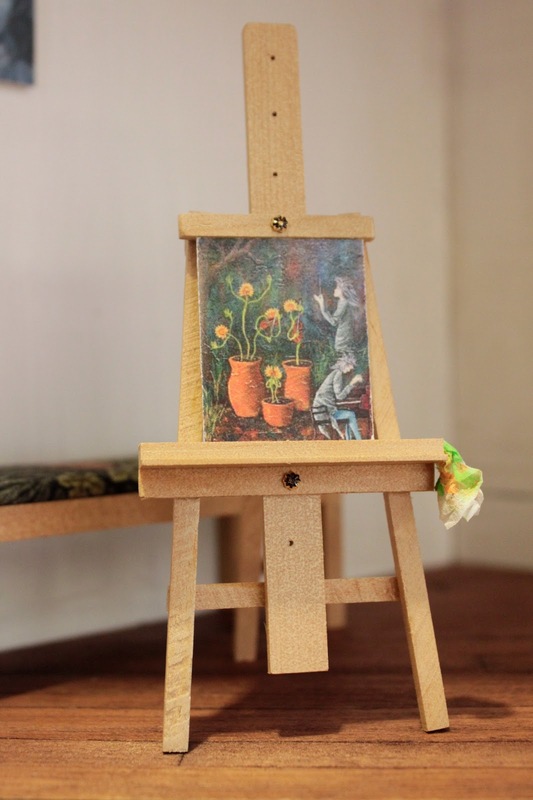 Today (Easter Monday) I set myself the task of making an artist's easel for the Selina Rose Gallery. To the right is attempt No. 1. To the left is attempt No. 2. On the side wall is also the second bench seat for the Gallery which I made yesterday. This image shows the back of the easel. The legs do fold in on both easels. Close up of the easel holding one of my sister's paintings. 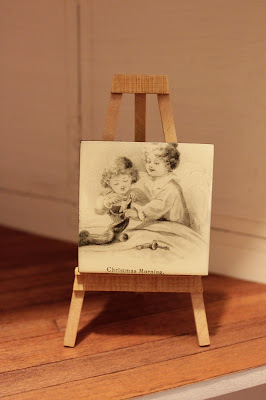 I had an idea in mind when I started the first easel but unfortunately I glued some pieces of wood on the wrong way so I ended up making it into just a simple easel, which as you can see has come in handy for photographing the resin images. I think I might use this one to hold a sign board. The second easel I made was more what I had in mind. It still needs perfecting. I would like to make it workable so I can adjust the easel to the size of the canvas on it. It has a little shelf and a little hook on the side for a dirty rag. Well, that is what I have created so far this Easter weekend. I really need to get some housework done tomorrow, but I am hoping to have a bit of time to experiment with some fimo. I hope you are all enjoying your Easter break. Hi Sharee, your experiments with the resin pouring are wonderful, well done! I thought it isn't easy to do, but you did it very well! Both artist's easels are great! Thanks Ilona. 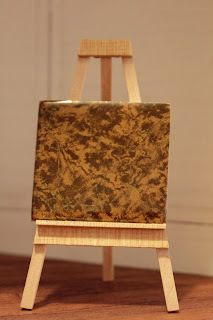 This particular resin was extremely simple to use, although of course it is something you would get better at with experience as with most things. It is a cold mix and I think as long as you have everything to hand and take your time you would get pleasing results. I understand it can yellow after years of exposure to the sun but in a dolls house that shouldn't be a problem. I'm keen to experiment some more and see what else I can come up with for miniatures. I am behind and trying to catch up on blogs- sorry for the late comment. I love how your resin experiments turned out. I have only worked with resin once and I would like to work with again- I think you learn more each time on what to do and not to do. I also really love your easels- especially the second one. They are beautiful! Thanks Kim. It is never too late to comment on any blog entry. Always appreciate comments. I'd love to do more experimentation with resin. I'd love to hear about it if you have another go with resin yourself at some stage.